Stuart Lancaster has ruled himself out of contention for a position in Andy Farrell’s new-look Ireland coaching team following the World Cup. With Joe Schmidt departing at the end of the year, there had been some suggestion that the IRFU would look to draft Lancaster in as attack coach, but having signed a new two-year contract with Leinster last week, the former England boss, who previously worked with Farrell, will not be double jobbing. 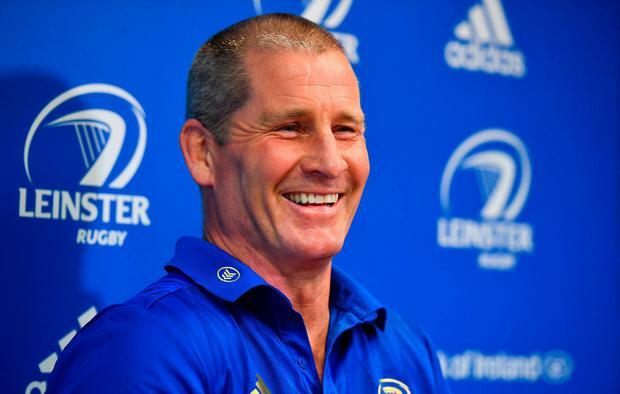 Instead, his entire focus will remain with Leinster despite confirming that several offers from elsewhere were on the table. “I don’t see how I can be when I’m fully contracted to Leinster,” Lancaster said when asked if there were any plans to work with Ireland. “There were alternatives presented. Obviously I’ve got to follow those up. To be honest, I only ever really wanted to stay here. “I speak to Andy all the time. I spoke to him during the Six Nations and we will catch up soon. But for me, the priority is to be a great club coach. “I was firm in my mind that I wanted to stay here. I mean obviously Andy has got the challenge now of building his own coaching team. I’m sure he’ll build it over the course of the next four to six months. Lancaster’s Leinster team have been boosted by the return to full fitness of Dan Leavy (calf) and Luke McGrath (knee). Both Ireland internationals are in line to feature against Edinburgh on Friday, but the outlook is less positive for Josh van der Flier who is awaiting results of a scan on a groin injury, while Robbie Henshaw’s troublesome dead leg looks set to rule him out of Leinster’s Champions Cup quarter-final clash against Ulster next week. Meanwhile, Joey Carbery (hamstring) remains a doubt for Munster’s European meeting with Edinburgh.